I never know what will hook Ryan’s interest in a new activity. But whenever there is a spark of curiosity, I do my best to carefully nurture it into a full-blown flame. The key is to listen closely for clues as to what aspect of whatever the subject is that he is following most closely, then emphasize that aspect over and over to encourage a deeper connection. Ryan has dabbled a bit in football lately. He declared a favorite team, and even watched its opening game, start to finish. He occasionally inquires about Michigan’s fortunes. He agrees to play football, either in the backyard or in video-game form, with one of his friends who is a football fan. Sunday was a glorious fall day in the northeast — perfect football weather. I wanted to get Ryan outside. I suggested taking a walk, to which he surprisingly agreed. Riley asked if she could come along on her bike. I decided to double down on my good fortune. “Let’s bring along a football and we can throw it around at the park,” I suggested. Ryan surprised me again by responding enthusiastically. I was thrilled. I’ve played catch with him on just a few occasions and I’ve treasured every one. He had in mind the hockey-played-with-a-football game we had invented at the beach. But I told him, no, we can play actual football. On the way, he went out for passes, hauling a few in and expressing frustration at the ones he dropped. When we got to the park, all three of us tossed a few passes while Ryan began to worry about the rules of the game we would play — filling his need to impose some structure on an otherwise unstructured activity. We eventually drew up boundaries using the lines on a soccer field and settled on rules: I was the quarterback, while Ryan and Riley would rotate on offense and defense. I talked them out of playing tackle in favor of two-hand touch. Two completions for a first down, first one to score wins. This was a game straight out of my youth, when I spent every fall Sunday with two friends, watching the NFL and playing this exact game in the backyard at every commercial break. The game didn’t last long — perhaps 15 minutes — and was won by Riley with a nice catch-and-run for the only score. But Ryan never asked to stop, never tried to turn it into hockey, and never questioned the rules. I chalked it up as a win we headed for home. The rest of the afternoon included a road soccer game for Riley, meaning Ryan and I would be home alone. He played video games on his iPad, we studied for various school tests and he finished his homework all while I watched football in the background. When the entire family came together again after Riley’s game, we ate dinner in front of the TV as I watched my favorite team, the Tampa Bay Buccaneers, attempt a second-half comeback against the Washington Redskins. Forced to put down his electronics during dinner, Ryan took a bit more interest in the game, once again showing me he knows more than he lets on. Right after I audibly gave up hope on my Bucs, he pointed out that they were only down two touchdowns, even though the margin was 15 points. I guess he was listening one of those times I described the two-point conversion. Perhaps it was when we made our big trip to Michigan and he realized that a two-pointer was all that stood between him and overtime. But what really drew Ryan’s interest was the plight of the Washington kicker, Billy Cundiff. He missed three field goals in the game, including two short ones. The third miss probably would have put the game out of reach for Washington. I casually mentioned to Ryan that Cundiff might be out of a job on Monday. It was no exaggeration. The NFL is a ruthless business, and kickers are particularly disposable. This did not sit well with Ryan. He kept asking what would happen to Cundiff. Would he get another job? Would he be OK? Was it fair that he might lose his job? How long were the kicks he missed? Should he have made them? Is it always the kicker’s fault when he misses? I did my best to answer his questions. He was genuinely concerned. He must have asked 15 times if Cundiff really would lose his job. I explained that yes, it was entirely possible, but that Cundiff had been kicking in the NFL a long time and probably had plenty of money saved. As it happened, Tampa Bay came all the way back to take the lead, but left Washington time for one last drive. 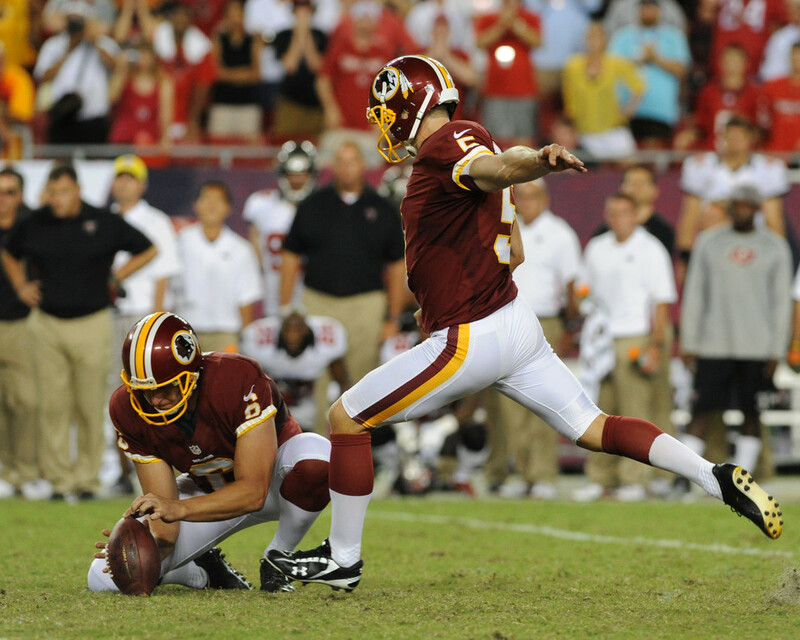 As the Redskins moved into position for a game-winning field goal, the announcers speculated if Cundiff might be able to save his job with a successful kick. Ryan’s interest perked up. Washington moved into range with a few seconds left. Cundiff jogged on to the field. We all guessed what would happen. Ryan was too nervous to offer a prediction. The kick split the uprights, giving Washington the victory. Cundiff’s teammates mobbed him. Ryan asked if he would definitely keep his job. I said I thought so. I assured Ryan it was fine that he pulled for Washington. I was touched by the human connection he found in watching the game, and I also found it ironic. Of the four of us in the room, it was the one with the social deficit that humanized a game on TV and made his choice who to root for based on the plight of an individual. The rest of us watched with no such personal connection — the same way we watch nearly every professional game. At bed time, I asked Ryan if he had found the game exciting. I hoped he might be encouraged to watch more football with me. He said that yes, it was exciting but really only because of the Cundiff subplot. I’ll have to go back to the drawing board the next time I want him to watch a game with me, but I have learned one valuable lesson — I need to use personalized, human moments to create a connection. I always thought the key to getting him interested in football or any other sport would be an appeal to his love of numbers and statistics, but it looks like I was as far off as Billy Cundiff’s first three kicks on Sunday. Good stuff! The new interest, the family time outside and the human connection. If there’s any positive to the fact that the NHL season is currently on hold due to a labor dispute (UGH), it’s that Ryan has expanded his horizons a bit with football. I’ll be searching for another human angle this Sunday, I can assure you!. Love. this. What an awesome kid you have!